The father of a victim in a police brutality case from Denver 10 years ago is again calling out John Hickenlooper, alleging that while mayor, Hickenlooper dodged requests for meetings from the family and provided no leadership on the matter, but briefly used it toward his own political ends during his first run for governor in 2010. Hickenlooper, a former two-term mayor of Denver and governor of Colorado, is currently running for the Democratic nomination for president. 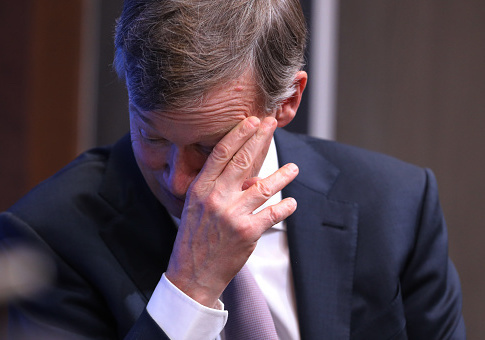 The caught-on-camera moment is one of several instances in which critics and the media questioned Hickenlooper's oversight of the largest police department in the state while he was mayor, criticisms which then rolled over into his handling of numerous criminal justice issues during his eight years as governor. Michael DeHerrera's beating at the hands of Denver Police in April of 2009 was caught on a city surveillance cam, creating instant controversy and making national news when the video eventually became public about a year later. The incident was once again in the news just last week when, on the 10th anniversary of the incident, an appeals court ruled the two police officers involved could get their jobs back. "Once we saw the video [in 2010], we had the video and everything, we were trying to get this in everybody's mouths I guess you could say, and trying to get help on trying to get these cops prosecuted and fired," Michael's father, Anthony DeHerrera, told the Washington Free Beacon by phone last week after the ruling. "We tried several times to meet with Mayor John Hickenlooper—he was mayor at the time. Every time we walked in the county building there in Denver where his office is, he walked out the back door." Anthony DeHerrera's advocacy on behalf of his son through the years has held extra impact because at the time, Anthony was already a respected 22-year veteran of the Pueblo Sheriff's Department about 100 miles south of Denver. It was that law enforcement experience that caused Michael to call his father that night after he and his friend, Shawn Johnson, had just left a club—police say the pair had been thrown out by security for causing a disturbance inside. Shortly after the club dustup and just about a block away, Denver cops had Johnson on the ground taking him into arrest while Michael, believing the tactics were too violent, called his father. The video shows Michael on his cell phone standing on a curb a few feet away from the officers when one walks up to him, grabs him by the head and neck and throws him to the ground face-first, where he was then struck several times with a sap—a leather pouch filled with lead that can shatter bone. Police reports said DeHerrera made some kind of move toward the officers, but the video does not support that. Anthony says he and his wife began trying to get in touch with Hickenlooper just two days after the incident and estimates he tried "calling his office once a damn week almost" from April 2009 until he left the mayor's office in January, 2011 to move across the street to the governor's office. "He never would meet with us, never did talk to us, he avoided us every single chance he got." More than a year after the beating but just days after the video was seen by the public, Hickenlooper requested a full investigation into the matter by the FBI. At the time, his final mayoral term was winding down, but the vote on his first gubernatorial run was just about three months away. "He was acting like he was helping us, which he never did," DeHerrera said about the call for the FBI investigation. "The mayor in his statement did not say what actions the FBI could take or why he wants that agency to perform a review," a Denver Post report from August 2010 noted. After Hickenlooper was elected governor in November 2010, another Denver Post report indicated no investigation was ever begun. "Though Denver Mayor John Hickenlooper issued a much publicized request in August for a Federal Bureau of Investigation review of police actions in the beating of Michael DeHerrera, the investigation basically ended before it started," the Post said. Michael DeHerrera and Shawn Johnson settled out of court any claims they might have had against the city, but continued to press for the firing of the two officers, mainly with Anthony acting as a surrogate. Hickenlooper, meanwhile, is making criminal justice reform a part of his platform as he continues his presidential campaign. "Speaking at the four-day National Action Network conference in New York, Hickenlooper touted his record attacking police misconduct as Denver mayor and pointed to changing the emphasis from punishment to rehabilitation and treatment for drug users when he was governor," a recent report by Colorado Politics noted. Emails requesting comment from Hickenlooper's campaign and leadership PAC were not returned. This entry was posted in Issues and tagged John Hickenlooper. Bookmark the permalink. Todd Shepherd is a staff writer at the Washington Free Beacon. He began his reporting career in radio, working as an anchor and reporter for KOMA in Oklahoma City and KOA in Denver. He spent eight years as the investigative reporter for the Independence Institute in Colorado, a free-market-based think tank. Campaigns and Elections magazine named him a "Top Colorado Influencer" for his reporting and news blog. He’s a graduate of the media studies program from Oklahoma Baptist University. His Twitter handle is @shepherdreports.